On a bike you'll experience Versailles like a king! Explore the local market, ride through forests and pastures, picnic along the Grand Canal, then see Marie-Antoinette's Hamlet, the Petit and Grand Trianons, and the Chateau inside and out! 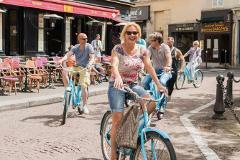 The Highlights of Paris Bike Tour is the best way to start your stay! Among other things, you will get up-close and personal with the Eiffel Tower, Notre-Dame and the Louvre. This tour also includes a snack break at a famous outdoor market. The "Paris Bike Tour : the Secrets” is a truly local experience. It's for those who want to get to know Paris' hidden charms and see what makes it so captivating to the locals. Created by Parisian born guides. 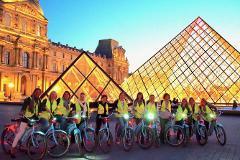 The Paris Night Bike + Boat Tour takes you to the best lit monuments in Paris. 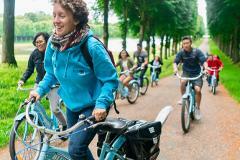 You'll cycle to and stop at the foot of many and see others during 1hr Seine River Cruise.